Pacman frogs are large, round frogs with big mouths and some yellow skin tones -- think Pac-Man, the video game phenomenon of the early 1980s. 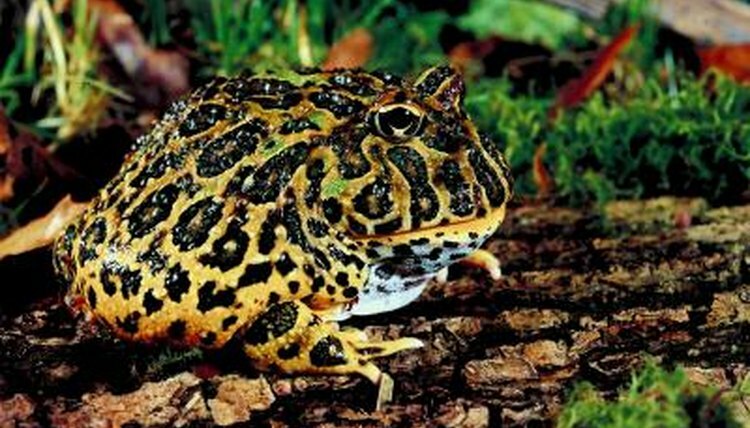 Pacman frogs (genus Ceratophrys) are also called ornate horned frogs and South American horned frogs. At maturity, female pacmans can reach 7 inches long and 7 inches wide Males are smaller than females, reaching up to 4 inches across. You can keep no more than one pacman in a tank, because the creatures are cannibalistic. Owning a pacman frog is a long-term commitment; an individual can live to be 15 years old. Pacman frogs are usually inactive, so they don't require a lot of space. A 10- to 20-gallon aquarium with a tight-fitting lid is sufficient. Lay a substrate of sphagnum moss, peat moss or coir deep enough for your specimens to burrow in. Pacmans spend most of their time buried up to their eyes in the damp substrate. Live plants provide hiding places and help to maintain humidity levels. Pacman frogs don't drink water, they absorb moisture through their skin. Bury a shallow bowl of chlorine-free water to a depth that's level with the substrate so your frogs can easily walk into it for soaking. Pacmans don't swim; they can drown in deep water. Keep the substrate damp by misting it once or twice daily. Spray it more frequently if you live in a dry climate or if your home is air-conditioned. Pacman frogs are cold-blooded animals who can't regulate their body temperatures. They're comfortable in ambient temperatures of 65 to 85 degrees Fahrenheit. Place your tank out of direct sunlight to prevent overheating. Broad-spectrum lighting is beneficial to plants and frogs. Provide 12 hours of light and 12 hours of darkness daily. Pacman frogs have big appetites; they'll will eat anything that moves. Careful feeding, though: They'll bite at fingers, mistaking them for food. Pacmans eat only live food, ambushing their prey. Small frogs require a varied diet of crickets, mealworms and waxworms. Feed your pacmans daily, and dust the feeders with vitamin powder every other day. Medium frogs will eat pinkie mice, while large frogs enjoy small mice and pinkie rats every two or three days. Clean the pacman's tank at least once a week. Wash your hands before handling your pacman frog -- because oils on human skin can be toxic to him -- and after handling him to reduce risk of salmonella poisoning. Gently remove him from the tank and place him in another container. Remove the substrate from the tank. Clean the tank with hot water and rinse off the plants. Don't use soap or detergent. Clean the substrate before replacing it, or use new substrate. Keep your pacman frog's habitat damp at all times, but not wet. If the substrate becomes dry and your frog seems to be dead, attempt to rehydrate him. When a pacman frog becomes dehydrated, his outer skin gets dry and tough as his body takes measures to conserve moisture. He becomes motionless and appears to have died. He may still be alive. If you rehydrate him before death occurs, he'll shed his outer skin and eat it.